Tuesday July 2 is the first of the two races of the year for the Palio in Siena (the second race is on August 16). The day of the Palio in Siena is a busy, frenetic day which starts with the “Mass for the Jockey” in the chapel right next to the Palazzo Comunale in the morning and ends with the Palio race in the Piazza del Campo around 7pm. Entrance into the Piazza del Campo is free, just be aware that to find a spot might mean camping out there a long time before. For more details on the event and tips for visiting, check out these articles on the Palio di Siena and this one on tips on enjoying the Palio as a tourist. The small medieval walled town of Monteriggioni steps back into the past in the next two weekends: July 5-6-7 and July 12-13-14. The castle is the perfect setting for the medieval fair called “Monteriggioni Crowned by Towers”, with a military camp and reenactment of various battles and sieges the castle has suffered in its history, storytellers, jugglers, musicians and craftsmen showing the ancient crafts through the streets of the small town. Check out the complete program here: www.monteriggionimedievale.com. On July 6 and 7, the town of Cerretto Guidi (just 40 km from Florence, near Empoli) remembers Isabella de’ Medici in “The Night of Isabella”. Starting at 7pm on Saturday, the center of Cerreto Guidi will fill up with characters in Renaissance costumes that will stage the scenes of daily life and of ancient crafts as well as put on itinerant shows. On Sunday, the festival will start in the morning and last all day. Events are free. 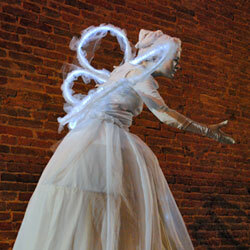 For more information, go to the Comune di Cerreto Guidi website: http://www.comune.cerreto-guidi.fi.it/index.php/eventi/1035-la-notte-disabella.html . 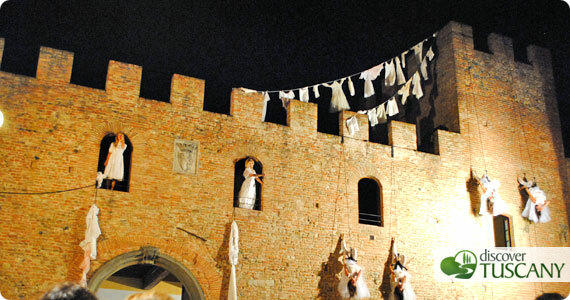 Starting Wednesday July 17 at 5pm and going on through Sunday July 21, the fascinating hamlet of Certaldo hosts the international festival dedicated to Street Theater called “Mercantia”. Street artists and bands are set up all over the high part of Certaldo, bringing the streets to life with shows and performances. Entrance to the festival is paid. On the weekend, the shows start at 6pm while on weekdays they start at 8pm. You can find many details on the official site here: www.mercantiacertaldo.it. Read about our experience last year at Mercantia. On Thursday, July 25, in honor of the patron saint for the city, St. Jacob, the city organizes the annual tournament called “Jost of the Bear”. During the tournament, held in Piazza del Duomo, 12 knights of the four city districts compete against each other by trying to hit with their lances the target shaped like a bear. The district with the most hits wins the contest. Tickets can be bought from 10 days before directly at the tourist office in Piazza del Duomo, as well as tickets for standing room the day of. The Festival of the Unicorno, in its 9th edition this summer, is without a doubt one of the most original events in Tuscany. Held on Saturday, July 27 and Sunday, July 28, the small town of Vinci transforms into a fantasy world populated by cosplay characters and entertainment in line with the fantastical theme. You can find more details on the official site: www.festaunicorno.com. The summer in Tuscany is also synonymous with good music and the month of July is packed with major festivals you shouldn’t miss. 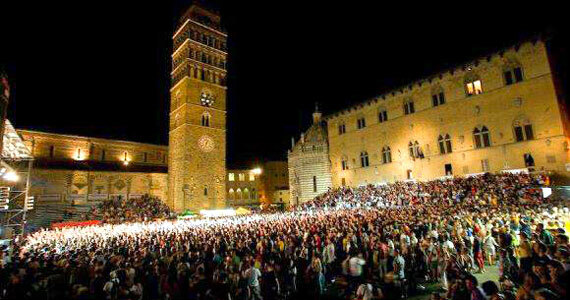 Starting Wednesday, July 3 through Sunday, July 7, Pistoia hosts great music at the Pistoia Blues festival. The main concerts are held in Piazza del Duomo, but other events are held at various locations across Pistoia, both indoors and outdoors. For more details and program, go to the official site: http://www.pistoiablues.com/. The Lucca Summer Festival this year will include artists the like of Brian Adams, Leonard Cohen and Litfiba. The festival starts July 6 and goes through the end of the month until the 30th. For details, check out the official site: www.summer-festival.com. This year, the events for Arezzo Wave planned for July 10 – 14 will take place both in the Park of Albergo, a suburb of Civitella Val di Chiana, and in Arezzo. New emerging bands will alternate with well-known artists, both Italian and international. You can check out the full program on the official site here: http://www.arezzowave.com. The Teatro del Silenzio, or Theater of Silence, in Lajatico, Pisa is the setting for the spectacular annual Andrea Bocelli concert. This year, the concert is held on July 13. If you need tips on getting there and how to organize the evening, check out this useful thread on our forum.